I never thought about how to make French pie recipes because I never related “pies” with France. When I think of French desserts immediately crème brulee, profiteroles, soufflés and custards come to mind. Then there are my favorites; éclairs, chocolate mousse and delicious napoleons. Never pie! I do know of tart recipes but I consider them different from my pie recipes. In my desire to learn more about how to make French pie recipes, I began my research. Starting with one of my many boxes of collected recipe, immediately I gathered several recipes for French silk pie. 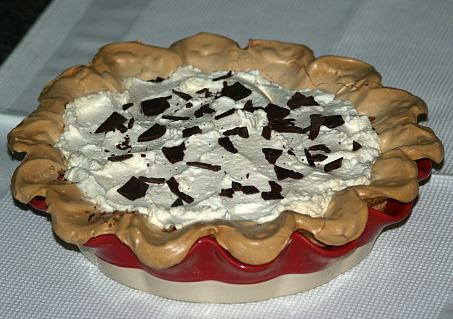 French silk pies seem to be the most famous of all French pies and in many versions. Even though I was familiar with these recipes, the “French” just did not register. After a little research, I could not trace this recipe to France. The only information I could find on silk pies is from a bake off contest which was held by the Pillsbury Company many years ago. Since I decided to learn how to make French pie recipes, I pulled out all my pies which were title “French”. I assumed these recipes would have to contain ingredients which have made French desserts so famous. Ones like creamy cheeses, milks, heavy creams, eggs, butter and chocolate have contributed to the popularity of French foods, especially desserts. After checking all my pie recipes, I found these to be mostly true. The one ingredient that I overlooked was all the different fruit used in making French pies. If you are learning how to make French pie recipes, I am including this crust recipe for your convenience. It will make 2 DOUBLE crusts. Combine flour and salt; cut in shortening until crumbly. Combine egg, water and vinegar; pour all at once into flour mixture stirring until flour is moistened. Knead dough until smooth; divide into 4 equal parts and roll out on lightly floured surface. If you want to learn how to make French pie recipes, I believe this is the Pillsbury French silk pie from the bake off. Prepare pie crust according to package directions for unfilled ONE CRUST pie using 9 inch pie pan. Bake crust about 10 minutes until lightly browned; cool. In small saucepan over low heat melt chocolate; cool. In large bowl cream butter gradually adding sugar; beat until light and fluffy. Blend cooled chocolate and vanilla into butter mixture. Add eggs to mixture one at a time beating well after each addition; pour into cooled pie shell. Refrigerate several hours before serving; garnish with shipped cream and chocolate curls. Store in refrigerator; serves 8. Learn how to make French pie recipes with rhubarb. Beat egg, sugar, flour, vanilla and sour cream until well blended. Stir rhubarb into egg mixture and fill pie shell. Combine topping ingredients until crumbly; sprinkle over the rhubarb filling. Bake pie for 10 minutes; REDUCE HEAT and bake 40 minutes longer until rhubarb is tender. NOTE: If you use frozen rhubarb add EXTRA: 1 cup of rhubarb, 3-4 tablespoons sugar and 1 tablespoon flour. Learn how to make French pie recipes with strawberries and cream. Beat cream cheese with JUST enough milk to make it spreadable; spread over bottom of pie shell. Place 3 cups of berries over the cheese; mash remaining berries. Combine and mix sugar, butter and flour in a saucepan; add mashed berries. Cook mixture stirring constantly over medium heat until mixture thickens; boil additional 1 minute. Cool thoroughly; pour over berries in the pie shell. Learn how to make French pie recipes with raisins, nuts, cinnamon, allspice and cloves. Cream butter and sugar until light; add eggs one at a time beating JUST until blended. Stir in spices, vinegar, raisins and nuts; mix well and pour into pie shell. Line 9 inch pie pan with half of the pastry dough; arrange half of the apples in the pie shell. Combine and mix together sugar, cinnamon, nutmeg, salt, flour, raisins and lemon juice. Sprinkle half of the spice mixture over the apples; cover with remaining apples. Sprinkle remaining spice mixture over apples; dot with butter. Cover pie with a top crust; trim and crimp edges. Cut several slashes in top crust for steam vents; bake 45 to 55 minutes until crust is browned. Combine and blend powdered sugar, milk and vanilla; spread over the hot pie. Cool before serving; serves 8. Learn how to make French pie recipes with coconut and vanilla. Beat eggs, sugar, coconut, vanilla and vinegar until well blended. Add butter blending well; pour into unbaked pie shell. Bake for 40 to 50 minutes until set and golden brown; serves 8. Combine apples and cranberries in a large bowl. Combine ¾ cup sugar, flour, ¼ cup brown sugar, cinnamon and nutmeg; add to cranberry mixture tossing to coat. 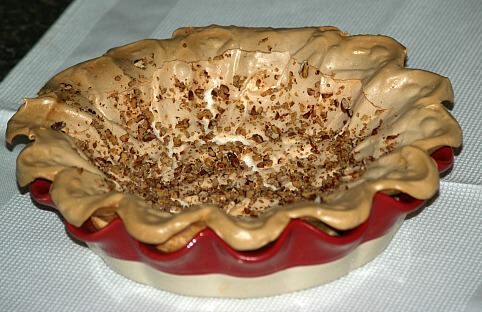 Spoon mixture into pie shell. Combine ½ cup flour, 1/3 cup brown sugar, ¼ teaspoon cinnamon, dash nutmeg; stir to blend. Cut butter in mixture with pastry cutter until crumbly; stir in pecans. Serve warm or cooled; serves 8. Preheat oven to 275F degrees. TO MAKE CRUST beat egg whites and cream of tartar to soft peaks. Add sugar 1 tablespoon at a time beating to stiff peaks about 4 minutes. 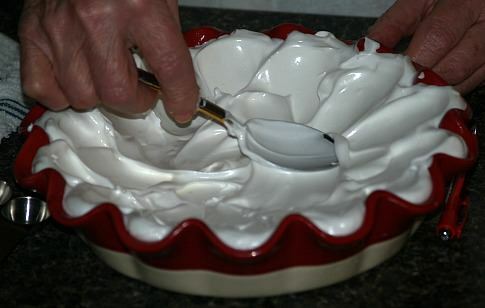 Spread meringue in a well buttered pie plate building up the sides with a rounded soup spoon. Sprinkle the bottom with chopped nuts; bake for 1 hour then COOL. TO MAKE FILLING melt chocolate in top of double boiler. Beat butter until fluffy; add sugar and vanilla beating until smooth. Beat in eggs one at a time beating well after each addition (2-3 minutes after each); beat in chocolate. NOTE: Mixture should be fluffy, pale chocolate in color and sugar should be dissolved. Pour mixture in cooled meringue shell. TO MAKE TOPPING in a chilled bowl beat whipping cream and crème de cacao to stiff peaks form. 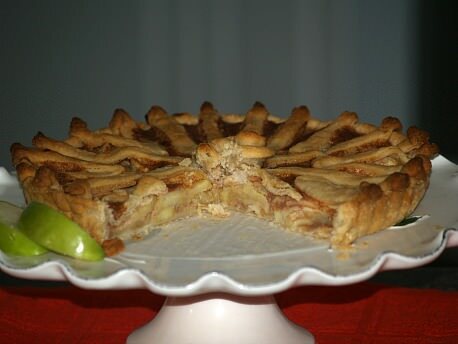 When I learned how to make French pie recipes, I found most recipes to be “silk pies”. Place 2 squares of chocolate in top of double boiler over boiling water; REDUCE HEAT to low to melt and then COOL. Cream butter gradually adding sugar while beating on medium speed of mixer until light and fluffy. Stir in cooled chocolate; add eggs one at a time beating 5 minutes after each addition. Fold whipped topping into mixture and spoon into baked pie shell; chill 2 hours. Beat whipping cream until foamy; gradually add powdered sugar and beat until stiff. 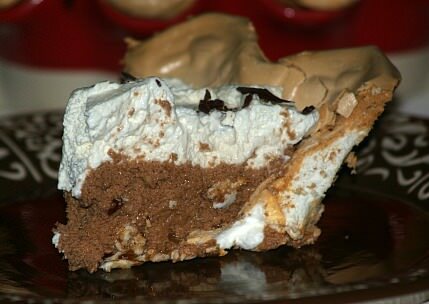 Spread whipped cream over pie; garnish with chocolate shavings. 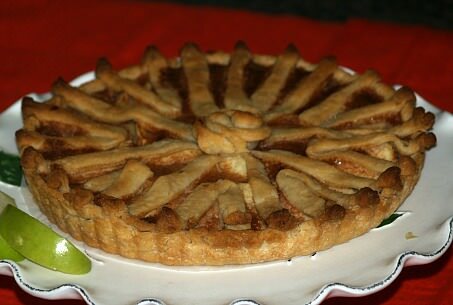 When you learn how to make French pie recipes, you will likely come across tart recipes. They are more common to French recipes and are baked in “tart” pans instead of pie plates. Preheat oven to 425F degrees; use a 10 inch tart pan with removable bottom. Roll enough pastry dough to line bottom and up sides of tart pan; trim off excess dough. Do not prick bottom; partially bake 10 minutes. (If crust puffs up, gently press back to bottom and sides with back of spoon). TO MAKE APPLE FILLING combine all ingredients in a large skillet over medium low heat. Sauté about 5 minutes stirring occasionally; remove from, drain and set aside. TO MAKE CUSTARD FILLING combine all ingredients in a small bowl and blend. 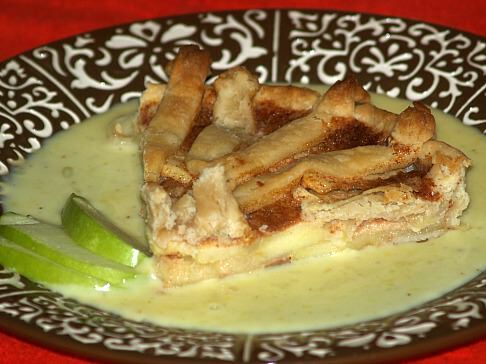 After spooning APPLES into prepared tart pan, pour custard over the apples. Roll remaining dough and cut into ½ inch wide strips; use dough strips to form a pattern on top of tart. Bake tart for 20 to 25 minutes. TO MAKE CRÈME ANGLAISE combine egg yolks and sugar in a small bowl. Bring cream to a boil in saucepan; blend a little hot cream into yolk mixture. Quickly stir yolk mixture back into saucepan; cook over low heat about 10 minutes. NOTE: Mixture will coat spoon but DO NOT BOIL. Remove mixture from heat and stir in vanilla, cinnamon and nutmeg. TO SERVE pour small amount of sauce in serving plate. Remove sides from tart pan and cut into wedges; place warm wedge on top of sauce.